What would you ask a vampire if you had the chance to sit down and ask him anything with no fear of ending up as a meal? We think it would be pretty fun to query where they're still getting all that velvet and lace. And if we were pushing it, we'd probably ask the name of his interior designers. After all, every vampire movie we've ever seen has epically large gilded mirrors and huge candelabras that we've never been able to find at our local Pier One. Okay, okay. We understand that centuries of undead lifestyle might allow plenty of time to collect some special antiques but we'd hope that a vampire who's willing to talk to us would hook us up with antiques as well. We're all about pushing our luck here at Halloweencostumes.com! All in the name of rad, spooky style. This Made-By-Us costume will make you look right just right as you emerge from the dusky depths of a Gothic castle. Our very own in-house designers researched classic vampire costumes in classic literature and movies, coming up with this rich ensemble. The costume features a waistcoat with a lush scrolling pattern that's repeated on the jacket's lapels and cuffs. The shirt front simply loops around the neck, letting you wear whatever is most comfortable under the jacket and waistcoat. Finish off your look with dramatic makeup and a dark wig and you'll be ready to head out to meet the night! Are you ready to show your mysterious and dangerous side? This costume will make you crave a misty moonless night as soon as you get it out of the box. Whether you're dressing up for Halloween or you're heading to a themed party, your costume will look timeless and perfectly photogenic. 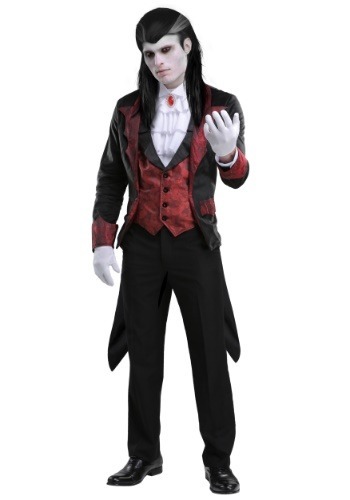 As dapper as he might be, we wouldn't want to meet this vampire in a dark alleyway.